The Prince of Wales abandoned the comfort of the Royal Train carriage to ride on the footplate for part of his trip around Yorkshire and Cumbria. The prince climbed into the engine room of the Duchess of Sutherland steam locomotive after the train pulled into Kirkby Stephen station in Cumbria. He donned blue overalls and the traditional black "greasetop" steam engineman's cap for a 15-minute run. The prince also visited Clapham in the Yorkshire Dales earlier on Tuesday. 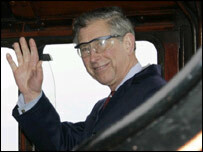 It is only the second time in more than 40 years that the royal train has been pulled by a steam loco. He said: "I can't tell you what a pleasure it is for me. It really takes me back to my childhood." The prince also chatted to children from Kirkby Stephen Primary School before being shown around the village's recently restored station. He then unveiled a plaque to commemorate his visit before heading for Appleby where school children cheered him on his walkabout. Charles began his day with a visit to Clapham, viewing a number of projects around the village supported by the Yorkshire Dales Millenniums Trust of which he is patron.